St. Theophan Academy: Off she goes! Our little princess is taking off for a 5 day trip to visit a skete with her godmother. Meanwhile, mommy has been busy finishing up a few sewing projects, some skirts to work and play in at the skete, and a new dress. 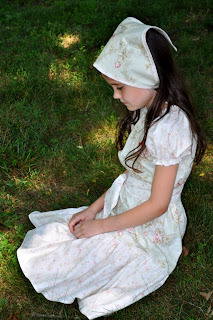 I found Pink Fig patterns just last week, and had to make this sweet peasant dress and kerchief for her. I have never tried shirring before, and I love it! I admit I have been a sewing snob in the past, using mostly heirloom techniques, but I have learned that if I am going to keep up with sewing for 3 girls, I need to learn some shortcuts! Not to mention, as the little princess gets older, I have even more desire to continue sewing for her as the selection of reasonably priced premade clothing does not encourage a young girl to grow into a young lady :) So, I am always excited to locate a fun pattern for an older girl that she likes and I still consider sweet. I don't recommend this pattern for a beginner seamstress though, as there are a few gaps in the instructions, and some corrections I had to make, but if you are comfortable with sewing, these patterns look like a lot of fun. 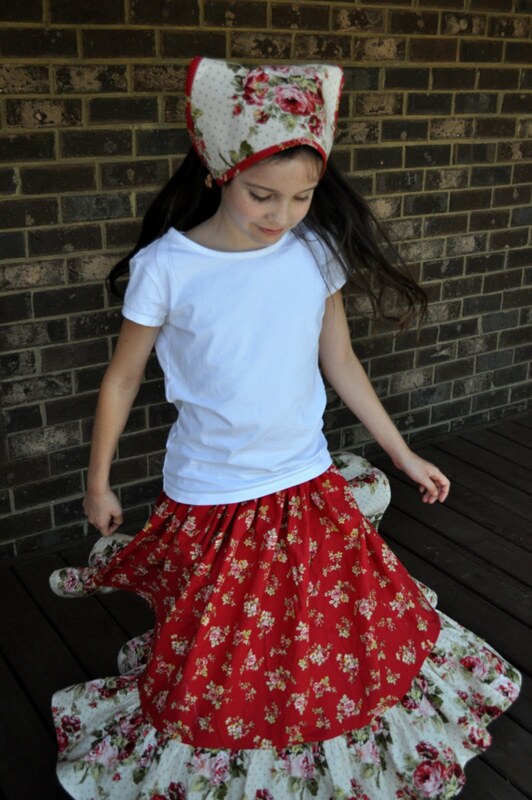 Another favorite around here is the twirly skirt. What little girl (or big girl for that matter!) doesn't love a twirly skirt. Here are a few I made for work and play. So, she is ready to head out, bursting with excitement, next time I think I might have to go too! I hope she enjoys her time! Love the twirl skirts! And I love the fabrics you chose for all the dresses. I've been wanting to make a few for Juliana (and myself). Do you use a pattern for them? Beautiful skirts !!! I don't know how to sew...but seeing your posts (and your skirts) really make me wish I did ! I find it so hard to find skirts I like for my daughter - and she isn't even 4 yet ! thanks Leah - the fabrics believe it or not were all cheap quilter fabrics from Hobby Lobby (not my favorite for sewing, but that means I don't worry about her "messing them up" :) I don't use a pattern for the skirts - might have to do a tutorial on that? They are super easy - I just do an elastic casing waist, then add a ruffle. I always loved a twirly skirt too. I hope she has a lovely time with her godmother. A tutorial would be wonderful! Of course, when you had spare time. I've attempted them before, but apparently I didn't use enough fabric because it lacked the big, fun twirl. I'll have to go check the fabrics out at Hobby Lobby (we now have one near us). Those fabrics are so feminine and pretty. Hope you daughter has a blessed experience, as I'm sure it will be. Those are beautiful skirts ! if you ever do write a pattern I'd love to have too :)) !